Worst Hero Siege EVER!!! Not many heroes, unoriginal hero spells, terrible amount of items, ugly terrain A-N-D... repetitive creeps! At this time I have a very buisy life work has taken over and my spare time to finish the map has become very limited, the map has allot to be done and I do wish I could finish it. But as I said when i get some time back I may go back and add on to the map..
What happened to make you quit your project? 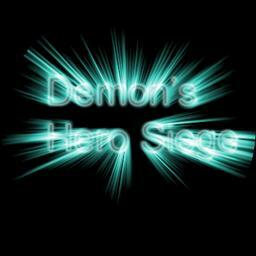 Sorry to say but as of this date I will be discontinuing Demons Hero Siege, I was surprised by the maps great reviews and I am doing this under great remorse. The project may be picked up again in the future. Overall improvement on everything, terrain, heroes, items, etc. I think that some of the new items needs more balancing though. Have you ever thought of posting your change log here? Hey Phtes, don't release new versions so soon unless you have a huge bug or something like that to fix. If you keep releasing versions like this players might get lost which version is the last one, and most of them don't even bother to come here and check. Also, your new version will have more impact if you hold more changes for one version only. LoL yet again just some updates in order to keep the change log going. --The dryad is a support intelligence hero that poisons enemies with every attack, and can dispel any harmful magic effects on friendly or dispel helpful effects on enemies. The dryads ultimate calls upon the roots of the earth to stop all units around her in there tracks. -Mana Potions have made there appearance at the Supplies shop for those intelligence heroes we all love. -Staff of Insight - increases all nearby units Mana Regen and grants the hero 20 intelligence. -Flare Gun - The mortar team has brought its technology to the battlefield and flare guns are now available for purchase at the supply shop, note these only affect fog of war mode. --The mortar team is a long ranged hero that can deal devastating damage to enemy units, capable of firing napalm shells to ignite the ground, or even flak shots for AOE damage, all will fear the sight of the mortar when he launches "The Big One". All nice additions, I am glad that you are actively adding. Man I go to sleep and you entice me with all these sweet new features, bah! -The potions are tired of hanging around up to so they have moved to the upgrades building fittingly renamed "Support Building". -New shop has been added, Jewelry, this shop now contains the pendants and newly created ring items. -Many new items have been added that modify attributes for heroes, also new legendary item. --The shaman is a support strength based hero that can blood lust friendly units, lightning shield them, or hex enemy units/heroes in order to turn the tide of battle, the shamans ultimate calls upon a devastating earthquake sending a ripple though the earth. -The paladins base damage has been reduced and hes been changed to an intelligence hero. (Note more heroes will be added soon, lacking ideas atm). -The unique waves have been edited now certain waves will start using effects such as faerie fire, mana burn, etc. -All bosses have been increased in difficulty. -Currently working on making the terrain more eye catching. -Fixed minor bugs with bounty not showing reward text. -Aura mode has been temporarily removed until the Warcraft lock up it causes is fixed. Is there any reason to keep the potion shop unreacheable?